Brand new form manufacture. Discount Selling. Leather Professional grade and quality Ideal.. 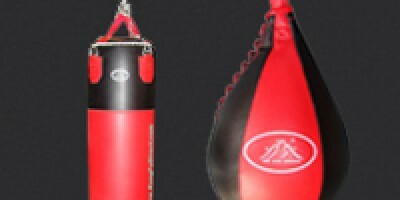 Heavy Punching Bag: Brand new form manufacture, Discount Selling.Color: Black with redSize: Diameter..
heavyleather85 - Heavy Leather Punching Bag - 85 lbs. Heavy Leather Punching Bag:Brand new form manufacture, Discount Selling.Color: Black with redSize: D..
Professional Leather Pear punching bag hook and jabColor: Black with redSize: Diameter - 48", bag le..
Leather Professional grade and qualityIdeal for boxing, kick boxing, martial arts, and cardio classe..
To provide a good workout, your speed bag platform needs to be solid. Made from heavy gauge steel to..